Tonkinese are easy to care for cats. Bathing is optonal and not needed unless the cat gets really dirty. Routine nail trimming and occasional brushing is all the maintenance that is required. Some owners recommend a rubber curry brush, which the cats seem to enjoy. 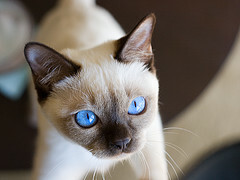 Tonkinese cats are smart, personable and comical. These cats are seem to be born with the certainty that humans were put on the planet just to love and care for them. Tonkinese love to have lots of people around and tend to get along fine with children who have been taught how to handle cats as well as with other cats and some dogs. They like activity and if left alone for too long will become bored or lonely, so it would be a good idea to make sure to provide an companion, preferably another Tonk. Be prepared to give lots of attention when returning home, after explaining to your Tonk, where you went and what took you so long to get home! 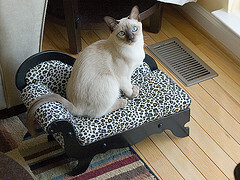 The Tonkinese has a lovely coat, medium short in length, soft and silky, with a lustrous sheen. Possessing a muscular, medium-length body, this breed is surprisingly heavy for its size. The head is a modified wedge, slightly longer than wide, with visible cheekbones. The nose is small and curves from the eyes with no visible break in the line. Eyes are almond-shaped but rounded on the bottoms. This cat is loving, impetuous and demanding. Tonks are playful adventurers who tend to take over the house and win over any humans within it. They make excellent comapny, and will greet you at the door upon your return from an outing. Very friendly to everyone, they play most of the time, and would involve their humans in the play as well. Working humans will discover that two Tonks kept together will play games and have fun, which will lessen the chaos that can be created by one bored Tonkinese. Terrific companions, Tonkinese cats are happiest when they are the center of attention and have lots of love to give in return.